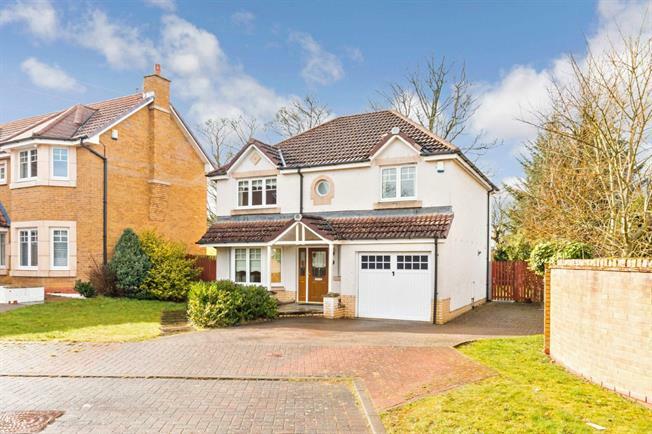 Enjoying a wonderful cul-de-sac position within ever popular West Craigs this detached villa offers spacious accommodation with a pleasing wooded backdrop. The property provides accommodation formed over two levels as follows: reception hall, WC, lounge with bay window, formal dining room and fitted dining kitchen with breakfasting bar and French door access to the rear garden. The first floor landing leads to four generously sized bedrooms, master with en-suite facilities and family bathroom with walk in shower cubicle. Fresh and tasteful decoration is a feature throughout with the property further benefitting from both double glazing and gas central heating. An expansive block driveway leads to the integral garage with the remaining garden grounds offering a high degree of privacy with attractive views. Long admired by the discerning family buyer this development ensures easy access to a variety of amenities including quality schooling, town centre shopping and train station.